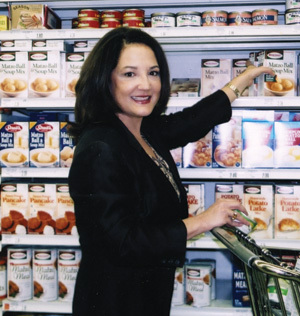 Holly Skolkin could often be found at the supermarket shopping for Aishel House residents. Holly Harwood Skolkin passed away peacefully at home on February 10, 2012 surrounded by her family. Holly was born in Houston on June 22, 1952, to Doris Zellda and Earl Isadore Harwood. She had a happy childhood with sisters and best friends, Bonny and Cindi. At the University of Texas, Holly was an active member in Alpha Epsilon Phi sorority where she made many lifelong friends. She became a skilled silhouette artist, cutting freehand facial profile likenesses of people from Houston to Disneyland. Following graduation in 1974 with a degree in photojournalism, she began a distinguished career in medical photography. Holly worked in the Ophthalmology Department at the University of Texas-Houston, Baylor College of Medicine, and Emory University where she produced world class fluorescein angiograms and ophthalmic ultrasounds. She served on the National Board of The Society of Retinal Angiographers. After the birth of her children, her professional career was subrogated to raising Dayna and Emory, the joys of her life. She shared with them her love of Judaism, ethnic foods, movies, and family vacations. She adored her many nieces and nephews. Her guiding message, a variation on the Beatles lyric, was “in the end the love you make should be more than the love you take“. She involved her family and friends in her many mitzvah projects, including The River and Aishel House, two organizations for which she was a founding board member. She treasured her extended family in Hadassah and at Congregation Beth Yeshurun. Her spirituality and optimistic attitude helped her battle stage 4 breast cancer for nearly 15 years. She was a role model, companion, and confidante for numerous cancer patients and their loved ones. It was often a difficult journey, one that inspired the creation of the Rose Ribbon Foundation by sister, Cindi Harwood Rose, and brother-in-law, Dr. Franklin Rose, in her honor. She was preceded in death by her parents. She is survived by her husband, Mark, children, Dayna and Emory, and sisters, Bonny Cotlar and husband David, Cindi Harwood Rose and husband Dr. Franklin Rose, and their children Erica Rose and Ben Harwood Rose. The family is most grateful to her many caregivers over the years, including doctors Richard Theriault, Gerry Cypress, and Rush Lynch, as well as Elena Velasquez and her friends in the Nursing Department at St. Luke’s Episcopal Hospital. Those who wish to make a memorial contribution are encouraged to support the Rose Ribbon Foundation inspired by her generous heart; soon to be re-named the Holly Rose Ribbon Foundation in her honor by making a donation here: www.roseribbon.org, or other charity of their choice. Rest peacefully, our Holly Dolly, and know that we will miss you and the world is a better place because you were here.